Many of you will have seen the brooch found at Rocky Clump in 2011 (Illustrations1 and 2). The brooch is in remarkably good condition maybe because it was found at a depth of about three feet in a layer of coarse chalk nodules that probably acted as a cage protecting the brooch from mechanical deformation. It is possibly a La Tene III style brooch made from one long continuous piece of copper alloy. This is one of the most common types found in Britain and because of its minimal decoration is often known as a "poor man's brooch". It is derived from a continental style called Nauheim and is therefore also known as a Nauheim derivative with features including a four coil spring and internal cord, a bow tapering towards the foot and a catch plate that can be perforated or not (Hattatt, 1985). 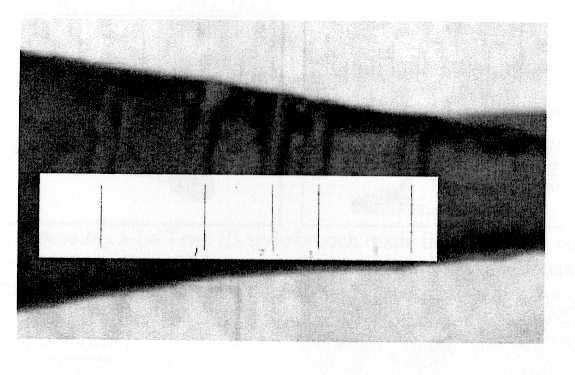 When I took these photographs it had not been conserved but there is clearly distinct though minimal decoration on the bow consisting of fine lines scratched longitudinally near both edges and a series of broader transverse lines near to the catch plate (Illustration 3). M. R. Hull in Cunliffe (1971) describes the most numerous group of brooches found at Fishbourne, Sussex as Neuheim Derivatives "but there is no genuine Nauheim type amongst them". He states that all have solid catch plates and some have transverse grooving which does not appear commonly elsewhere. The Rocky Clump brooch appears similar to those found at Fishbourne. The spacing of the transverse lines on the bow is not at regular intervals and at first I thought they may be random. However, upon closer inspection I realised they may constitute a recursive pattern based on the "rule of thirds". The rule of thirds is a well known way for artists to compose their images in a pleasing manner with the canvas divided horizontally and vertically into thirds. The main elements of the composition should lie along the lines or at the intersections to create a pleasing picture (for example see D. Mize). This rule is a simplified version of the concept of the Golden Section (see R Knott). I have viewed many examples of brooches on the Portable Antiquities database (http:llfinds.org.uk/database) and in the literature but have not seen any similar recursive design engraving. Whilst it is possible that the design is random I do not think that engravers would scratch a meaningless design. I think the designer of the decoration worked like this - first of all draw the two outside lines then divide the space in between into 1/3 and 2/3. Next, take the bigger portion and divide this in the same way - 1/3, 2/3. Now take the next bigger portion and divide in the same manner. The diagram above replicates this procedure. When dividing a whole into 1/3 and 2/3 sections it can be seen that the ratio of the whole to the 2/3 section is 1.5 (1/2/3). I have measured the spacing of the engraving along the midline of the bow on a magnified image of the brooch and found that the ratios at each of the three steps illustrated above are 1.476, 1.495 and 1.485. An idealised 1/3 recursive pattern is compared to the brooch in the fmal illustration 4. Measurements at the edges of the bow will give different results but it is reasonable to assume an engraver would centre the design on the midline. I think that this very good match is good evidence that the engraver of the design on this brooch had, at least, an intuitive understanding of the "rule of thirds" and recursive design. R.&#9;Hattatt, hon Age and Roman Brooches (Oxford, 1985), p. 20. 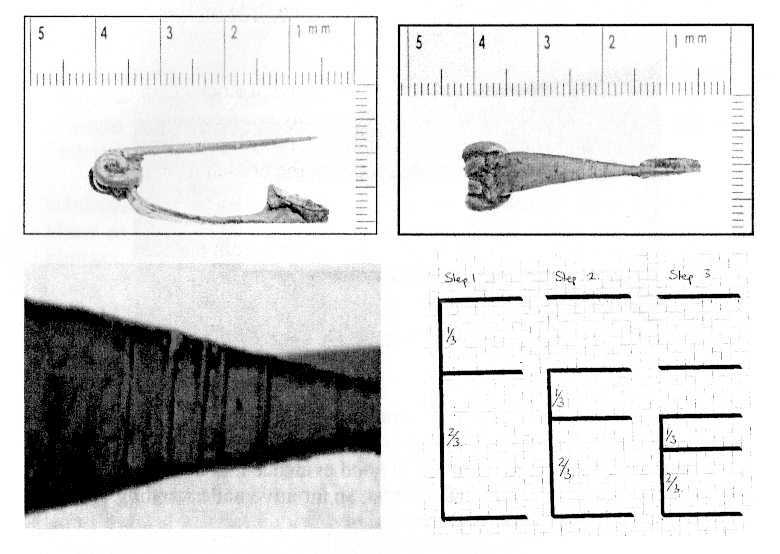 B.&#9;Cunliffe, Excavations at Fishbourne, Volume II: The Finds (Leeds, 1971), p. 100 and fig. 36, no. 1-9. D Mize, http://emptyeasel .cornI2009/02/03/the-rule-of-thirds-why-it-works-and-how-to-use-it-in-your-art/ accessed 16032012. R.&#9;Knott, http://www.rnaths. surrey.ac. uklhosted-sites/R. Knott/Fibonacci/phi.htnil accessed 16032012. BHAS participated in two heritage events last year at Michelham Priory and Peacehaven Meridian Centre. This is a regular commitment made by BHAS to the local communities and provides opportunities for interested individuals to gain an understanding of BHAS activities. The Micheiham Priory event involved two BHAS stands: a display of bones and an interactive experience, mainly for children, cleaning flints. The Priory event was supported by Maureen Cahalin, Steve and Eva Corbett, Carol White, her son and David Worsell. At Peacehaven the BHAS stand provided information of the local archaeology, with examples of artefacts as the audience consisted mainly of adults. BHAS attendees were John Funnell and David Worsell. At both events several visitors were keen to have items identified, often found in back gardens. BHAS were fortunate to have professional quality displays made by Fran Briscoe which explained the work of BHAS. The organisers of the two events welcomed the BHAS contribution, with about one hundred attendees at Michelham Priory and two hundred at Peacehaven. The Outreach activities provide an important engagement with the community and help interested persons to join our activities. One teenage girl at Micheiham Priory joined the dig team at Bishopstone Tidemills following the Outreach event. This year we have been invited to Brighton and Hove Museum for finds processing on the 18th July as part of the Festival of Archaeology and shall hopefully be back at Micheiham Priory.